High Quality Glass Smoking Pipes - Glass Pipe with Free Gift. The Pipe Depot by the Deals Zone is here to provide you with the most enjoyable pipe smoking experience while catering to all of our client’s unique needs. The British poet William Cowper said, “variety is the very spice of life and gives it all its flavor”, and we at the Pipe Depot couldn’t agree more which is why we offer stone smoking pipes, wood smoking pipes, and our awesome line of glass smoking pipes. We believe in spicing up the meditative and leisure activity of smoking by granting variety, and we start with our fun and affordable line of glass smoking pipes. How are Glass Smoking Pipes Made? Glass smoking pipes are handmade by glassblower artists in which fine sand is mixed with natural colors and baked in an oven. Glass artists wear heavy-duty aprons and protective clothing to safeguard themselves from hot glass fragments that can spit back and cause severe burns. The artist starts by inflating molten glass into a bubble and uses a blowpipe to blow air into the glass bubble while turning it to give it a desired shape. This is done at temperatures between 1,600 and 1,900 degrees F. Color shards are then added and blown into the glass smoking pipe before it is dipped in water to make it more pliable for shaping. Then the finished product is placed in the annealer—a special oven for glass that gradually brings the temperature down at a controlled rate so that it is safe to cool over night. We at the Pipe Depot offer a wide assortment of glass smoking pipes hand blown by the most innovative artists in the industry who put a lot of love into their work. 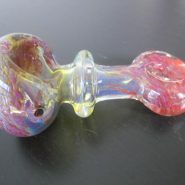 Check out our glass smoking pipe inventory and don’t forget to also visit our selection of stone smoking pipes because like glass, stone is also cool to the touch and offers a smooth taste. For the time being take a few moments to learn about the history of glass blowing and see if this method speaks to you on a deeper level! 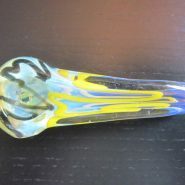 What is the History of Glass Pipes? 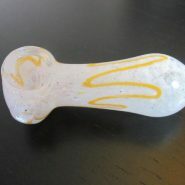 The history of glass pipes has its early roots embedded in the Middle East along the Phoenician coast in 3000 B.C. and also had its practices at the same time in Egypt and Mesopotamia through the art of jewelry making. It wasn’t until 30 B.C. in Rome that glassblowing techniques were developed and continue to be performed in the same manner today. Archaeologists have uncovered early Roman glass pipes dating back to this time period, but it wasn’t until 1970s America that the glass pipe and glass bong became a cultural and iconic smash hit in which a rich smoking culture was created. If you have questions about our handmade smoking pipes, or if you are new to this recreational activity and you want to know how to smoke a glass pipe, please contact us so we can give you the best customer service experience of your life! How do you Smoke a Glass Pipe? When you learn about the Pipe Depot you will discover that we stop at nothing to offer a class of customer service next to none, and we always put our customers first, without compromise. This means we are standing by to answer any questions you may have about pipe smoking, or our fine products. When you order your glass smoking pipes for weed from the Pipe Depot you will love the extra special care we put into each order. You will get FREE and FAST shipping, FREE smoking pipe screens, an easy payment method, and an amazing customer service experience! We also discreetly pack your marijuana pipe so the nosy neighbors or prying girlfriend can’t give you the third degree! 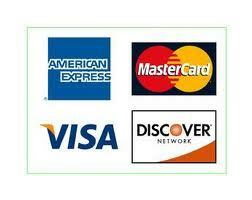 Shop around our site, and let us know how we can be of assistance!